The Chicago Children's Theatre will break ground on a first phase project to revamp the empty former police station at 100 S. Racine Ave. into the theater's new headquarters. WEST LOOP — The Chicago Children's Theatre plans to break ground on its new home in the West Loop later this month. The children's theater will host a groundbreaking ceremony with staff, supporters and city officials at 10 a.m. Dec. 12 at the shuttered Near West District 12th District Police Station at 100 S. Racine Ave. The Chicago Children's Theatre plans to convert the former police station building into a mixed-use performing arts facility with two theaters, classrooms, offices, parking and green space, according to theater spokesman Jay Kelly. The Dec. 12 ceremony will officially kick off a first phase of construction, which will see the existing building converted into a cultural space that includes a flexible studio theater and classrooms. That phase is expected to be completed by early 2017. A second phase of construction will see a state-of-the-art, 299-seat mainstage theater developed on site. The second phase is expected to be completed in 2020. "After 10 years of staging our productions and educational programs at museums, theaters and other venues throughout the city and suburbs, our new home will provide CCT with a solid foundation to engage, inspire and serve all Chicagoland families," Russell said. "We so look forward to graduating from an itinerant company to a theater with a permanent home." The new theater will be designed by Wheeler Kearns Architects and Working Group One Architects. Pepper Construction is the project's general contractor. 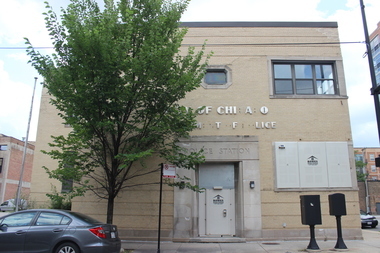 The shuttered police station was purchased earlier this year from the City of Chicago with additional project funding from the State of Illinois. The Chicago Park District previously turned down the old police station property. In November 2014, then-Gov. Pat Quinn announced the children's theater would get a $5 million grant from the state. In addition to state funding, the non-profit theater is also seeking city funding and private donations to fund the project's build out, Kelly said. The children's theater proposal did receive some opposition from the neighborhood. In October 2014, community group Neighbors of the West Loop came out against the children's theater plan, saying that it would rather see a community center or library developed at the site. But a vast majority of neighbors did support the project, Ald. Walter Burnett Jr. (27th) said in 2014, including the West Loop Community Organization and West Central Association Chamber of Commerce. Near West District police moved into a new station at 1412 S. Blue Island Ave. at the end of 2012. The former police station has been used by the NBC television show "Chicago Fire" for filming.